This past weekend we headed up North to begin some birthday festivities for Alyssa who is turning 6!! We decided to surprise her this year and take her to Build-A-Bear. I'm sure most of you have been there, but we never had. It was all a good time, and in the next few weeks and month the other 2 have decided they want to go there as well! It was a big hit! Here she is with the Hannah Montana bear she picked out. Absolutely refused every other single one in the whole place. Oh, and don't mind her black eye. She was running last night and plowed right into grandma's couch. Great present for your birthday huh, poor thing! I told her, "Look at ALL the other choices." Nope, didn't work. It was the highlight of her day! It just dawned on me now, that we didn't even get a final product picture. I will have to get that and add it later. Last Friday night Eric took his 11 yr. old scouts on a smaller version of the Klondike! They dug snow caves and slept in them over night. Preston isn't quite old enough officially, but Eric let him go. They had a really fun time, and I know Preston loved spending time with his dad! Preston & Eric outside their cave. The next morning. Preston slept great! Goofing off before it was time to go home. The next morning the boys climbed on top to see if they could cave in their caves. I don't think it worked. Preston and Eric again! Two of my special boys! I'm glad you guys had a great time! Sorry for the missing Flashback Friday post! Our hard drive is slowly dying that has all of our pictures on it, so Eric unhooked it until we can get a new one. We can't afford to lose those pictures, so we just have to do without for now. So until I can access those pictures, we'll just have to postpone Flashback Friday! I was also tagged by Hydee to do a 4's tag. But once again, no 4th folder, or no 4th picture at the moment. Sorry!! On a way better note, Eric passed his 3rd out of 5 guard tests today with 100%!!! Hope you are all having a great Sunday!! Cost of admittance: $1.00 that will go to the Neil Barnes medical fund. Enter our drawing to win prizes! Top 10 Reasons I Love My Job! This past weekend I was able to attend regional training in Layton! It was AWESOME! Usborne Books is a great company, with a fantastic product, and I love being able to share it with others! They also announced that we are adding the Kane/Miller publishing to ours at EDC!!! These books are also incredible and will make an excellent addition to our product line! 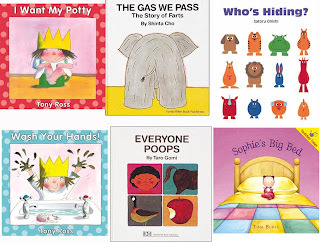 Some of their more popular titles include: Everyone Poops, The Gas We Pass, Who's Hiding, Wash Your Hands, Sophie's Big Bed, and I Want My Potty! As most of you know, last summer really sucked for me! I was more depressed than I have ever been in my life, and as I am slowly coming out of that, I can honestly say that Usborne has helped pull me out of that slump. I have always wanted to be able to stay at home with my kids. My only jobs have been at daycare centers where I could take them with me, so luckily so far that has worked out. I never wanted to pursue a career where I had to leave my kids, and after last year I vowed I would definately never work at a job I hated again! When I joined Usborne I had no idea if it was something I really wanted to pursue. Well, after about 9 months in the business, with some really busy times, and some really S-L-O-W times, I decided I am in it for the long haul! I believe it is a perfect fit for me and my family's needs! We had some excellent training, won great prizes, made many new friends, and had a blast! I also had my picture taken with the CEO of Usborne, Randall White! 1. I don't have to get up early! 2. I can still stay home with my kids! 3. I work the nights I want to, and my "shift" is only about 3 hrs! 4. I have built a great library for my kids and family! 5. Doing shows gives me that business edge, filled with success and accomplishment! 6. I make great friends! 7. I LOVE what I sell! 8. I get to enrich children's lives by promoting literacy & reading! 9. I can help contribute significantly to the family finances! 10. It gives me a night out a couple days a week, and it's fun!